Schoolgirl Boitumelo Dlamini’s killers Cynthia Mosupi (left) and Sharon Gugu Thwala. One of the women had hoped to have her sentence reduced because she’d accidentally also burnt herself. The two women who murdered Lethlabile schoolgirl Boitumelo Dlamini by dousing her with petrol and setting her alight were on Monday sentenced to stiff jail terms in the High Court in Pretoria for their gruesome deed. 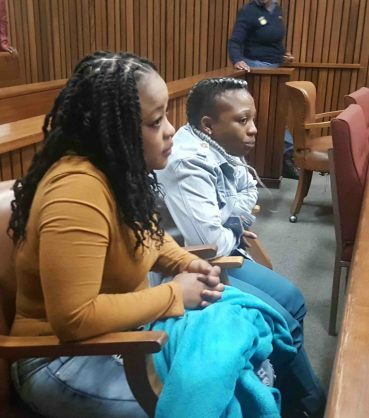 Judge Tshifhiwa Maumela sentenced Cynthia Mosupi, 24, to 18 years’ imprisonment and her friend Sharon Gugu Thwala, 25, to 14 years’ imprisonment for kidnapping and murdering schoolgirl Boitumelo Dlamini. 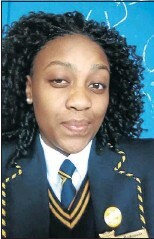 Schoolgirl Boitumelo Dlamini, who was doused with petrol and set alight. The women in June 2015 kidnapped Dlamini from outside Eletra Secondary School, where she was writing her matric exam, and took her to the bushes near the Klipgat cemetery, where she was dragged out of the car, doused with petrol and set alight while frantically pleading for her life. The two had planned in advance to confront Dlamini about her suspected relationship with Mosupi’s former boyfriend. A video of the pleading schoolgirl’s agonising death, in which her loud screams and cries could clearly be heard, served as evidence in the trial. The video also showed Mosupi and Thwala assaulting and restraining Dlamini while Mosupi repeatedly warned her to stay away from her former boyfriend. It ended with Mosupi pouring petrol on to Dlamini while Thwala was holding on to her and the petrol igniting, burning Dlamini alive. Judge Maumela said the video showed that Dlamini was helpless and not putting up a fight, but was trying to get away and pleading frantically while she was being assaulted. She even promised to never see Mosupi’s boyfriend again, but her pleas fell on deaf ears and she was subjected to physical and mental torture with her attackers showing no mercy. He said a mere view of the police photographs had the effect of traumatising onlookers. The judge said it boggled the mind why Mosupi had whipped herself up into such violent emotion about Dlamini’s relationship with her former boyfriend while she had declared publicly she’d lost her love and affection for him. Even if she still loved him, it did not justify the lengths to which she went. She also enlisted Thwala in her vicious scheme to kidnap and torture Dlamini. Thwala had nothing to gain from the attack and appeared willing to do anything to please Mosupi. He said the accused had to go out of their way to get petrol; they took along a used tyre and drove with their victim to a deserted place to ensure they remained unseen and undetected. One doubted if they would have come forward if it had not been for Mosupi suffering burns that required medical attention. Judge Maumela said that although both accused appeared not to have appreciated the gravity of their conduct and came across as nonchalant at the start of the trial, both of them had expressed contrition and regret after they were convicted. He said they were still young when the crimes were committed, they could still be rehabilitated and did not deserve permanent removal from society.